Some of you know that my profession involves using words and grammar to convince people to buy things. (If I wanted to be “PC”, I’d say that I’m truly trying to create brand awareness, but the bottom line is, brand awareness still means we want people to buy things. So there) Given that my profession as a copywriter means I’m familiar with marketing speak, I thought I was a little less…. how do you say… gullible when it comes to packaging terms. 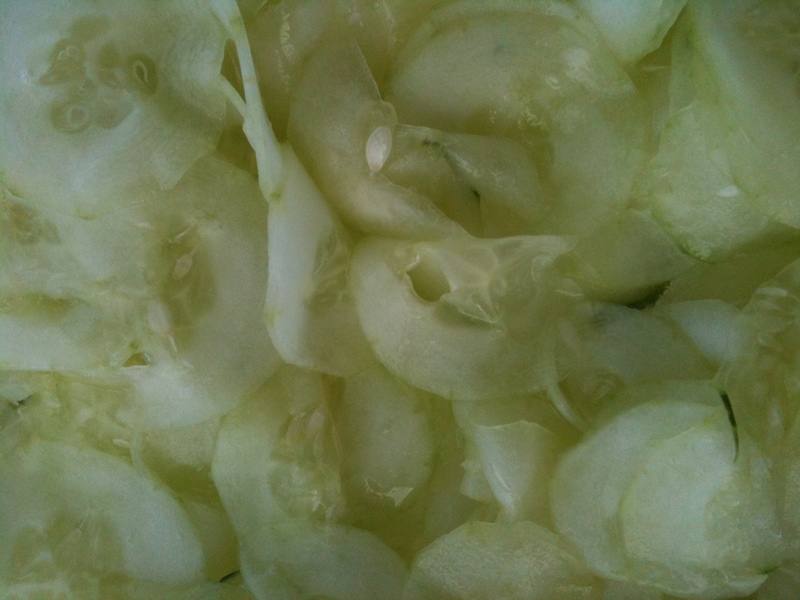 Tonight, I was preparing a favorite warm weather dish of mine – cucumber salad. 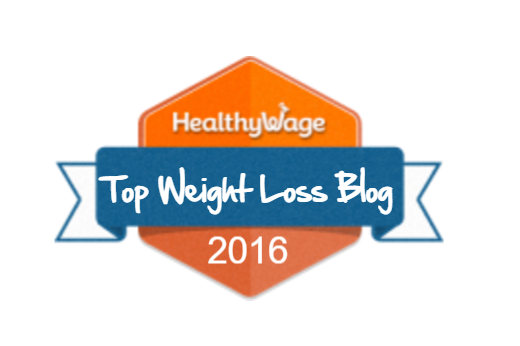 It’s relatively low in calories and fairly simple to make, requiring few ingredients. First, peel two cucumbers and use a mandoline slicer to make them paper thin. Sprinkle them liberally with salt, and let them soak for about half an hour in just the salt. After half an hour, make sure your hands are clean, and then get in there and SQUEEEEEZE the moisture out of those cucumbers. SQUUUUEEEEEEZEEEEEE! You want them mostly dry, otherwise you’ll feel like you’re drinking from the ocean. 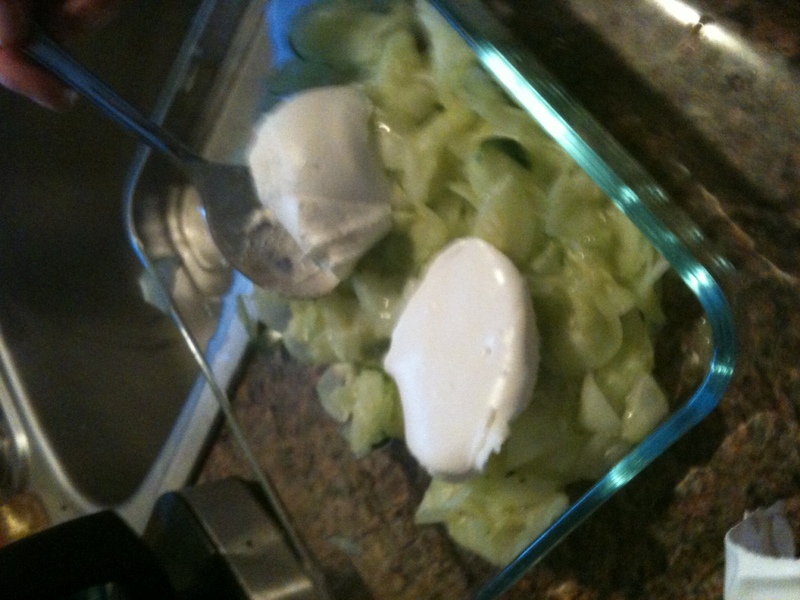 Then, when all the cuke slices are squeezed and mostly dry, add one TBSP white vinegar and two big dollops of sour cream. Notice that I wrote sour cream and not sour creme. Cuz this? This is “UNREAL!! !” Sour “creme”. And you know what that means? This is “unreal” sour cream. Like for realz. Sour creme.. that’s not sour cream. I took a bite while I was making this salad and something tasted… Off. And then I thought, well, it needs to be refrigerated so maybe that’s why. But then I thought, wait, this is the easiest recipe in the world and it tastes WRONG! I took another taste and thought, hmmm. Something’s wrong with this sour cream. And then I realized… No, it’s not low fat… but it says UNREAL! You don’t think… OH YES! It’s artificial sour cream. This entry was posted in Food, Random Ramblings and tagged artificial sour cream, cooking fail, cucumber salad, kitchen misadventure, low fat, sour cream, sour creme, summer recipe, yuck, yummy. Ew! Why do they make fake, worse for you version of EVERYTHING now?!? I’ll take my sour cream naturally, thank you! Uhhhh whaaa? LOL I love how it brags about the great taste. Clearly they haven’t spoken to you! That business people can make unhealthy products to save on materials and then use babble to get round the law (if there are any real laws on food anymore) is abhorrent. I often wonder if on their death beds do these ministers of evil have regrets? Wouldn’t you think that other business people around them would berate them for the wrong they are committing on children and other sentient beings? bought Yoders because I thought their phrase “unreal” meant extra good. Us d it in an easy dip I routinely make. The dip tasted bad. I checked the Yoders to see if it was out of date or reduced fat. It wasn’t. Ended up googling it and found this page. 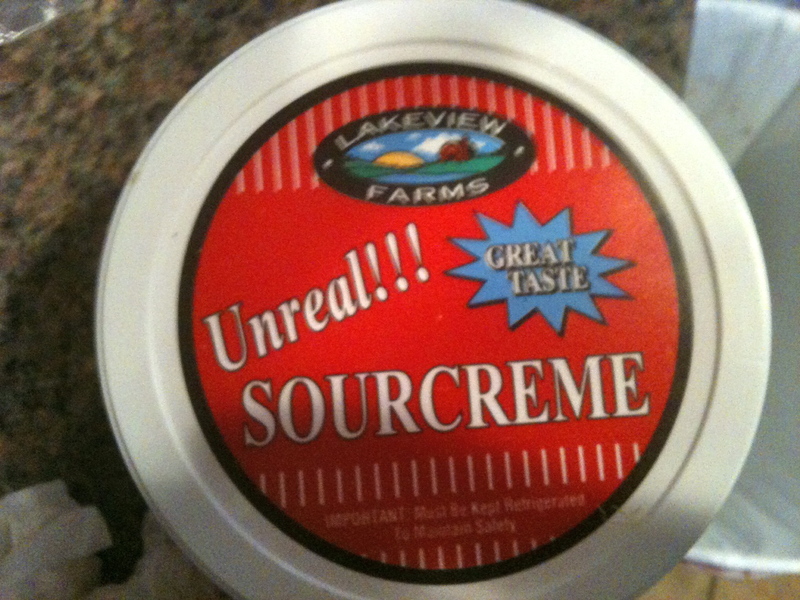 Had no idea “unreal” meant fake sour cream. Didn’t even notice it is called “sour creme” as it is not sour cream. I now notice it has trans fat as well. I don’t buy anything with trans fat. 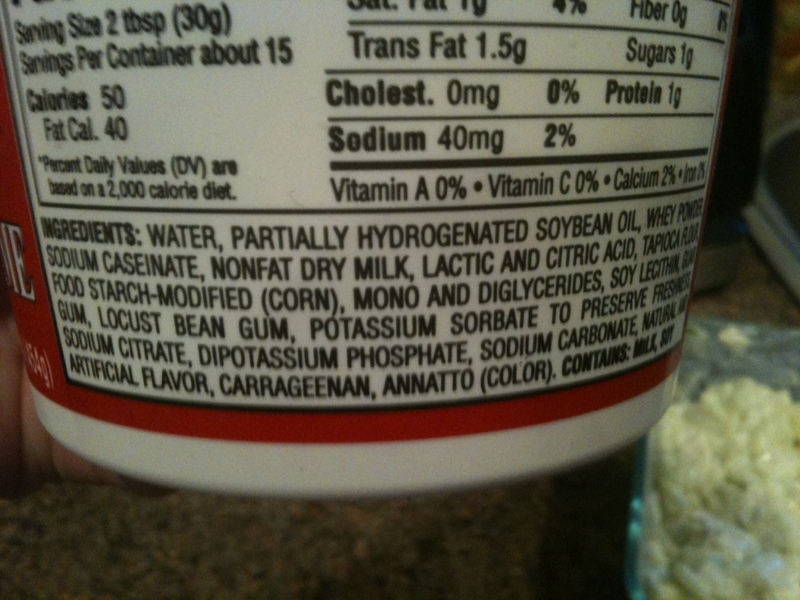 The labeling on Yoders sour creme is misleading. I bought the exact same thing, thinking it was just sour cream, noticed a funny & yucky taste after putting it on potatoes. Checked the date and it was ok. Thought I would look it up on line and found this page… story sound familiar? looks like im not the only one that fell for this fake stuff. I’m going to check twice next time….. this is what i get for being in a rush. I found this stuff today at the dollar tree. Not sour cream at all but also not bad stuff. Tastes pretty good as long as your taste buds arnt expecting real sour cream. Im not going to expect sour cream next time I buy this stuff but I would buy it again. I tried this product. An hour after I ate it I had a allergic reaction and a sour stomach. I tried it and dislike it. It has too many artificial ingredients and chemicals. I threw out almost the entire tub.Will never buy it again. Only potential artificial ingredient is the color. Which is probably a mineral like calcium carbonate. So, I bought a stack of nicely packaged soybean curd, also known as tofu. Didn’t have much use for silken tofu. Found it can really make a decent enough sour cream substitute. This would be similar. It’s non dairy right? Every woman and less macho man thinks they’re lactose intolerant right? I bought one bowl on accident of this but the third ingredient in my is coconut oil its so nasty. Terrible dangerous trick to play with consumers trying to patronize Lakeview Farms. Unreal Sourcreme? Really Lakeview? I wont use any Lakeview products ever again and neither will my family and friends. I’ll text, fax and send copies to all warning them that you nor your products have any integrity. You are the DREGS of Dairy Infustry. You’re dangerous and can kill people with your tricks. I’d say shame on you but I’m sure you don’t know shame.